You’ve seen it a lot in movies and on TV. A scatter-brained cook rushes to a kitchen engulfed in smoke, opens the oven door and behold – the Christmas turkey is on fire. The whole oven is on fire and the smoke alarm is going crazy. However, this doesn’t happen only in movies, it’s a common accident. What can cause a fire in the oven? There are various reasons why an oven can catch a fire. It’s often more than just forgetting the dinner in it for a longer period of time. Leaving the oven on while there’s still something inside it and forgetting about it. Food scraps, grease spots and forgotten pieces of parchment paper. Cooking with too much grease can lead to splatters which ignite a fire when they touch the hot surface of the oven or the heating elements. Overflowing batter when baking cakes and other pastries can cause a small fire on the bottom of the oven. Baking on parchment paper but leaving too much outside the baking tray or pan. The edges of the paper can catch fire if they are too close to the heating elements of the oven. Grease build ups on the bottom, sides and the door of the oven can catch fire when heated. As mentioned above, there are several reasons why an oven can catch fire. However, what about cases when you simply forgot to turn it off after taking the cooked food out? Can leaving the oven on cause a fire? It depends on several factors. If there are grease splatters or if parts of the food have leaked all over the oven bottom, then even if it’s practically empty, an oven that’s still running on high temperature can cause a small fire. If your oven is clean there shouldn’t be any worry as fires need an ignition source (an electrical heating element or gas burner), fuel (oil splatters, grease buildups, food scraps) and oxygen. If you take one out, then there shouldn’t be any fire in sight. Can a self-cleaning oven catch fire? Self-cleaning ovens rely on high temperature (500°C to be precise) to burn off any leftovers and grease spots left from cooking. Thanks to their pyrolytic ground coat, such ovens can reduce any food bits to ash, making it easier for you to clean the inside of the oven. For extra safety, the oven walls are coated with special porcelain which is resistant to heat and acid. Another safety feature is a mechanical interlock which keeps the oven door tightly shut and locked during and after the self-cleaning cycle. This is to make sure that you, your kids or pets, won’t get burned by accidentally opening the door midway. So can a self-cleaning oven actually catch fire? 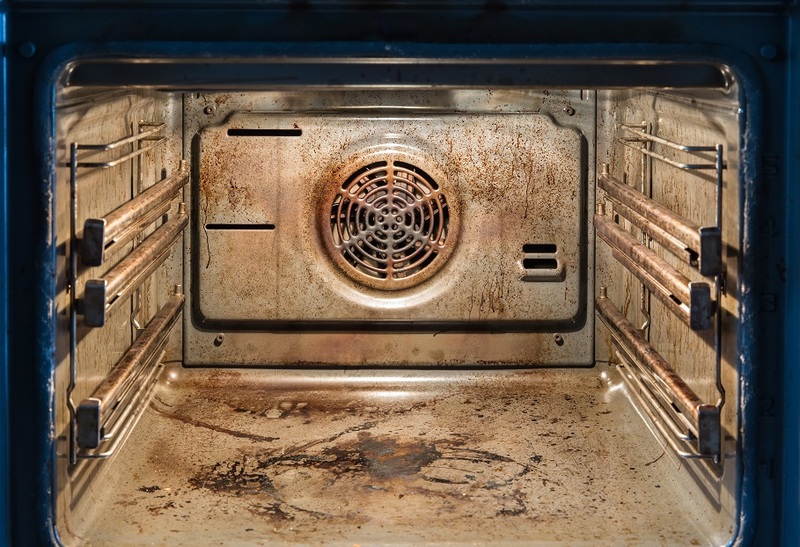 There are actually reports by owners who say that their self-cleaning oven caught fire midway the cleaning cycle. So it’s actually possible, but it’s not that common. The most common cause for flames in these ovens are food scraps and too much grease buildups. If you leave larger bits of food inside or know that there’s a tiny puddle of grease but still decide to turn on the self-cleaning feature, then you’re bound to end up with a grease fire inside the oven. Always make sure to remove any bigger food bits and grease buildups before using the self-cleaning cycle. There are also special cleaning products for self-cleaning ovens that are used before turning on the program. Another possible cause for a fire in a self-cleaning oven can be poor insulation or cracks in the porcelain coating. If you notice any of these, don’t use the self-cleaning feature before you fix them. Oven grease fires may not happen every day, but it’s important to know what to do when one does actually occur. Resist the urge to open the oven and see what’s going on! If you open the oven door, the flames will grow stronger as they have more access to oxygen. Not to mention that you can get severely burned all over your face and hands. Keep the oven shut and let the fire die out. Use a fire extinguisher to put out the flames. Remember that you should keep an extinguisher in your kitchen at all times. It’s best if you have one that’s for oil and gas fires. Call the fire brigade as soon as possible. 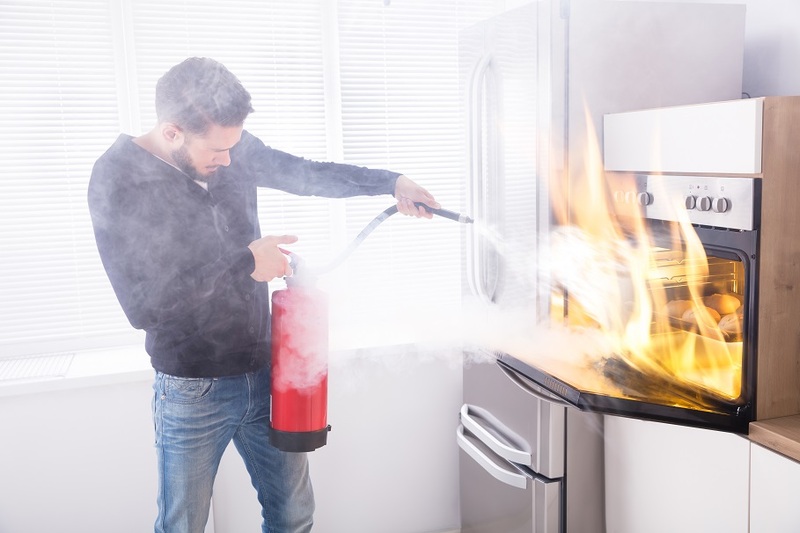 Even if you use a fire extinguisher, grease fires can be stubborn and it’s better to have professionals deal with them. DO NOT use water to put out a grease fire! Water will only cause the oil to splatter and cause the flames to expand. Some people say that pouring salt or baking soda over grease fires can put them out, but this works only on small-scale ones. You’d need a bucket or two of baking soda to smother a grease fire if it’s out of control. Apply this method only on really small, smoking grease splatters. You might think that once your cooker has been in flames, you can’t use it again and should buy a new one. Chances are you actually can use an oven after a grease fire. You just have to make sure you’ve cleaned it thoroughly and it’s functioning properly. But how do you clean an oven after a fire? There are several specific steps that you must take when cleaning an oven after fire extinguisher use. Wear a face mask and put on a pair of rubber gloves. These will keep you from inhaling or touching extinguisher residue. Get a dustpan brush and try to loosen up any caked up bits. Use a vacuum to clean as much of the dry extinguisher residue and the bits you’ve loosened using the brush. The next step is to clean the rest of the material with a damp sponge. It will get quite messy, so make sure you rinse the sponge frequently. Thoroughly wipe the entire inside surface of the oven. Do it more than once, just to make sure you’ve removed any caked on bits. Follow with a general oven cleaning as you’d normally clean it if there hasn’t been a fire. If the grease fire in your oven was rather small, chances are it died out on its own once the oxygen in the oven ran out. Maybe you’ve poured salt or baking soda over it just in case, to make sure it’s completely out. The cleaning process is basically the same as after fire extinguisher use. You have to vacuum any salt or baking soda, loosen any caked bits and remove any bits of burnt food. Once this is done, proceed with a regular oven cleaning. Hire professional oven cleaning services instead. Depending on the scale of the grease fire, ovens can usually be used again. After you’re done with the cleaning, contact a technician and have them determine whether the oven is safe to use after the fire. It’s important to know whether there’s been any damage to the parts and inside surface of the oven before using it again. Don’t skip this step as it involves your safety. Keep your oven clean and make sure you wipe any grease splatters or food spills once you take the food out. Place a baking tray or an aluminium foil sheet on the bottom of the oven. This way any food bits, spills and oil splatters will fall on them and will be easy to remove. Cover foods that might splatter. Make sure you don’t add more liquids than the recipe says in order to avoid any spills. If your oven is older, make sure it’s checked by a professional just to make sure that it works properly and that the insulation is intact. Did you ever deal with an oven fire? Leave a comment below, so we can discuss it.